2:03 a.m. – An alarm from Shapleigh Road was investigated and determined to be a false alarm. 4:29 a.m. – A citizen was assisted on State Road. 9:03 a.m. – A report of criminal mischief was investigated on Cromwell Street. 9:57 a.m. – An animal found on Seapoint Road was taken to Creature Comforts. 10:02 a.m. – An individual called to report they lost cash on US Route One. 1:32 p.m. – An officer responded to Williams Ave for a report of theft. 4:50 p.m. – A resident of Adams Drive reported suspicious activity. 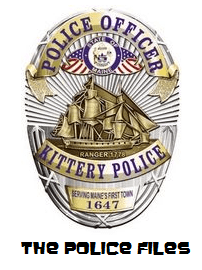 5:20 p.m. – Officers checked the Kittery area for a subject. 7:38 p.m. – Theft was reported on the US Route One Bypass. 8:25 p.m. – A citizen called to report harassment on US Route One Bypass. 8:51 a.m. – An officer investigated a report of theft from Woodlawn Ave.
4:09 p.m. – A stolen motor vehicle was recovered. 7:53 p.m. – AA report of suspicious activity on US Route One was received. 11:57 p.m. – An officer initiated a traffic stop on US Route One. 10:46 a.m. – A resident of Rogers Road reported criminal mischief. 1:21 p.m. – Paperwork was served on US Route One. 5:15 p.m. – Suspicious activity was investigated on Manson Ave.
7:52 p.m. – An officer assisted the fire department on William Ave.
8:35 p.m. – A possible juvenile problem was checked on US Route One. The juveniles were gone upon the officer’s arrival. 11:20 p.m. – Following a report of a domestic disturbance on Ledgewood Drive Ryan Sirois, 23, of 20 Briggs Land #5, Chatham, NH was arrested for domestic violence assault. 1:58 a.m. – Following a motor vehicle stop on Rogers Road, one subject was arrested and three others summonsed into court. Ryan C. Cudmore, 21, of 11 Errol Street, Sanford was arrested for disorderly conduct, loud unreasonable noise. Lisa P. Devore, 29, of 87 Diamond Lane, Sanford was summonsed for unlawful possession of scheduled drug. Adam Joseph William White, 21, of 20 Old Dennett Road, Kittery, was summonsed for sale and use of drug paraphernalia and possession of marijuana, and Darrick Ian Wilcox, 22, of 34 Haskell Ave, South Portland, was summonsed for sale and use of drug paraphernalia. 3:32 a.m. – Following a report of suspicious activity on Old Post Road Dale Hodgkins, 21, of 43 Martin Road was arrested for fugitive from justice. 1:02 p.m. – Suspicious activity was reported on US Route One. 5:12 p.m. – A theft was reported on Philbrick Ave.
9:43 p.m. – An officer investigated a theft on Martin Road. 2:08 a.m. – Officers responded to Old Post Road for a reported domestic disturbance. 3:52 a.m. – An alarm from Island Ave was investigated and determined to be a false alarm. 9:43 a.m. – Following a report of criminal mischief on Philbrick Ave Kevin A. Hills, 25, of 12 Bicknell Street #81 was summonsed for driving to endanger and criminal mischief. 9:49 a.m. – A theft was reported on Manson Ave.
3:05 p.m. – A hold up alarm from a business on US Route One was determined to be a false alarm. 6:50 p.m. – A dog bite was reported on Roseberry Lane. 6:55 p.m. – Following a traffic stop on US Route One Mark R. Healey, 22, and Brian R. Bulis, 23, both of Mansfield MA, were summonsed for possession of marijuana. 7:50p.m. – Shawn R. Donovan, 28, of Badgers Island West #B17 was arrested on another agency’s warrant and violating conditions of release. 8:21 p.m. – A dog was running at large on Boush Street. 9:40 p.m. – Following a motor vehicle stop on US Route One Cecilia M. Lacouture, 18, of 4 Raydon Road, York was summonsed for violating condition of release. 12:21 a.m. – An officer assisted another agency. 12:20 p.m. – An officer spoke to a citizen regarding a possible drug offense. 12:48 p.m. – Officers responded to Remicks Lane for a report of a disturbance. 1:35 p.m. – The area of the US Route One Bypass was checked for a stray dog. The dog was gone upon the officer’s arrival. 3:46 p.m. – A theft was reported on State Road. 3:55 p.m. – Suspicious activity was reported on US Route One. 4:08 p.m. – A motor vehicle accident involving two vehicles occurred on US Route One. 5:51 p.m. – Following a report of shoplifting from a business on US Route One Caitlin E. Feehery, 26, of 540 Main Street, West Newbury, MA was arrested for theft by unauthorized taking or transfer. 7:02 p.m. – Shoplifting was investigated on US Route One. 7:20 p.m. – A vehicle operating without taillights was reported on the I-95 Freeway. 10:11 p.m. – A dog bite was reported on Pettigrew Road. 4:43 a.m. – An alarm from Cutts Road was determined to be a false alarm. 7:45 a.m. – Officers responded to Old Post Road for a report of disorderly conduct. 7:51 a.m. – A subject came into the police department for a bail check. 8:16 a.m. – A report of disorderly conduct was received from State Road. 11:29 a.m. – An officer attempted to serve a warrant. 1:30 p.m. – Suspicious activity was investigated on Cole Street. 1:45 p.m. – A resident of Devon Woods Drive came into the police department to report lost glasses. 2:40 p.m. – A motor vehicle accident occurred on Philbrick Ave.
3:07 p.m. – A report was received of a barking dog on Highpointe Circle. 8:00 p.m. – An attempt was made to serve a warrant. 11:03 p.m. – An officer initiated a motor vehicle stop on US Route One. 10:04 a.m. – A two vehicle motor vehicle accident occurred at the intersection of US Route One and Wilson Road. 3:24 p.m. – Following a report of an assault, Craig Lyle Broe, 33, of 158 Dennett Road Ext was arrested for domestic violence assault. 3:37 p.m. – An officer assisted another agency. 4:52 p.m. – An issue was referred to another agency. 5:47 p.m. – A resident called to report an animal complaint on the US Route One Bypass. 6:14 p.m. – Suspicious activity was reported on Woodlawn Ave.
10:41 a.m. – A motor vehicle accident occurred on State Road. 10:58 a.m. – A citizen came into the police department lobby to report an animal complaint. 6:20 p.m. – Following a motor vehicle stop on US Route One Robin L. Finn, 46, of 147 Pepperrell Road was summonsed for operating while license suspended or revoked. 6:58 p.m. – A report was received of suspicious activity on Norton Road. 12:08 a.m. – Following a traffic stop near the intersection of Rogers Road and Shepards Cove Road Erik E. Byrne, 20, was summonsed for minor transporting liquor. 3:09 a.m. – Following a motor vehicle stop on the I-95 Freeway Terry Long, 46, of 66 Bartlett Lane, Eliot was summonsed to possession of marijuana. 7:46 a.m. – An alarm from a business on Shapleigh Road was determined to be a false alarm. 8:08 a.m. – An alarm from Walker Street was investigated and found to be a false alarm. 8:47 a.m. – A resident reported suspicious activity. 10:29 a.m. – An officer assisted with a vehicle that went off the roadway on Lewis Road. 2:40 p.m. – Following a traffic stop on Route 236 Robert W. Murtha, 50, of 28 Fernald Lane, Eliot was summonsed for operating with suspended registration. 4:17 p.m. – An officer assisted another agency. 4:53 p.m. – Assistance was provided to another agency. 8:54 p.m. – Paperwork was served on Jones Ave.
9:32 p.m. – An officer attempted to serve paperwork on Wallingford Square. 11:12 p.m. – An officer investigated suspicious activity they observed on the I-95 Freeway. 1:10 a.m. – Following a motor vehicle stop at the intersection of Rogers Road and Dion Ave Judith M. Murphy, 70, of 21 Manson Ave #35 was arrested for operating under the influence. 2:38 a.m. – An alarm received from Stevenson Road was investigated and determined to be a false alarm. 4:13 a.m. – An alarm received from Stevenson Road was found to be a false alarm. 5:12 a.m. – A noise complaint was received from Government Street. 8:58 a.m. – An animal issue was investigated on Haley Road. 9:52 a.m. – An officer checked on a possible vehicle registration violation on Brave Boat Harbor Road. 10:42 a.m. – An attempt was made to serve a warrant. 10:51 a.m. – A violation of a court order was investigated on Whipple Road. 11:02 a.m. – A bail check was conducted on Cole Street. 11:14 a.m. – An officer checked on a possible weapons violation on Pocahontas Road. 11:52 a.m. – A citizen reported suspicious activity. 1:11 p.m. – The animal control officer completed a kennel inspection on Betty Welch Road. 1:50 p.m. – A report of a burglary on Tower Road was investigated. 2:22 p.m. – Following a report of theft from a business on US Route One Joseph M. Dillon, 56, of 675 E 4th #1, South Boston, MA was arrested for theft by receiving stolen property. 5:29 p.m. – US Route One was checked for a possible drunk driver. 7:15 p.m. – Robert Ian Paterson, 38, of 91 Picott Road was arrested on a warrant. 7:34 p.m. – An animal complaint was received from a resident of Shepards Cove Road. 11:37 p.m. – An officer initiated a motor vehicle stop on Seapoint Road. 12:55 a.m. – Following a motor vehicle stop on Picott Road Amanda Marie Stobbs, 26, of 105 Norton Road was arrested for operating under the influence. 1:08 a.m. – Following a two vehicle motor vehicle accident on Lewis Road Ryan P. Sirois, 23, of 66 Lewis Road was arrested for violating condition of release, operating under the influence, and possession of marijuana. 8:41 a.m. – A possible out of state vehicle registration violation was investigated on Chauncey Creek Road. 12:02 p.m. – A business on US Route One reported a shoplifter. As a result, Donna Child, 46, of 675 Wallis, Rye, NH was arrested for theft by receiving stolen property. 1:08 p.m. – A chocolate lab was reported lost from a location on Route 236. 2:09 p.m. – Officers investigated a report of suspicious activity. 4:42 p.m. – A citizen came into the police department lobby to report harassment by telephone. 6:35 p.m. – A report of shots fired in the area of Haley Road was investigated. 4:50 a.m. – Assistance was provided to another agency on Gorges Road. 11:50 a.m. – An officer checked on suspicious activity they observed on Haley Road. 3:09 p.m. – A stray dog was reported on School Street. 3:59 p.m. – A report of phone harassment was investigated on Gailey Farm Lane. 6:15 p.m. – An officer assisted another agency on the US Route One Bypass. 6:17 p.m. – Suspicious activity was reported by a business on US Route One. 6:41 p.m. – Another agency was assisted. 12:15 a.m. – An officer checked on suspicious activity they observed on State Road. 12:43 p.m. – An alarm received from Rogers Road was investigated and determined to be a false alarm. 2:20 a.m. – An alarm received from a business of Government Street was found to be a false alarm. 4:30 a.m. – Another agency was assisted. 8:58 a.m. – An alarm from a location on State Road was determined to be a false alarm. 11:31 a.m. – A report of criminal mischief was investigated on Walker Street. 1:31 p.m. – A two vehicle motor vehicle accident occurred at the intersection of Shapleigh Road and Woodlawn Ave.
3:00 p.m. – A resident came into the police department to report the theft of medications. 4:24 p.m. – A motor vehicle accident involving two vehicles occurred on US Route One. 4:42 p.m. – A disturbance was reported on Manson Ave.
8:08 p.m. – An individual came into the police department to report a dog that was left out in the cold. 9:32 p.m. – A motor vehicle accident involving a single vehicle and a deer occurred at the intersection of Haley Road and Bartlett Road. This entry was posted in General Town News on December 27, 2014 by Chuck Denault.